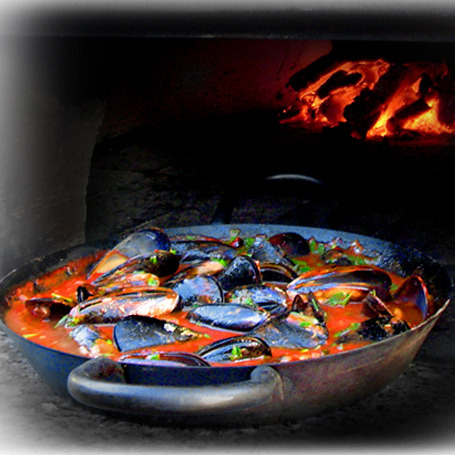 Why buy Forno Wood Fired Ovens? 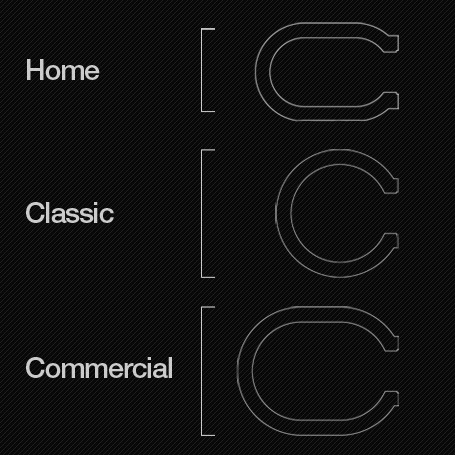 Continuous research and development for design, materials and manufacturing. Continuous research into the selection of the most appropriate material in oven construction. All Forno wood fired oven purchasers are invited to a free wood fired oven cooking demonstration – for a kick start with your new Forno; I cook, you eat and ask questions. Easy to maintain facia fabricated from 316 marine grade stainless steel. 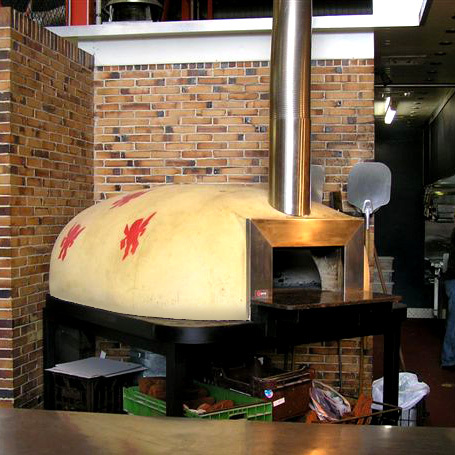 The stainless steel facia reinforces a common weak point in wood fired ovens. All flue sections are fabricated from 316 marine grade stainless steel. Installation in the Perth metro area of Western Australia is included in the price. Installation by experienced tradespersons on-site OR constructed on a reinforced concrete plinth girt by an angle-iron frame to freight. 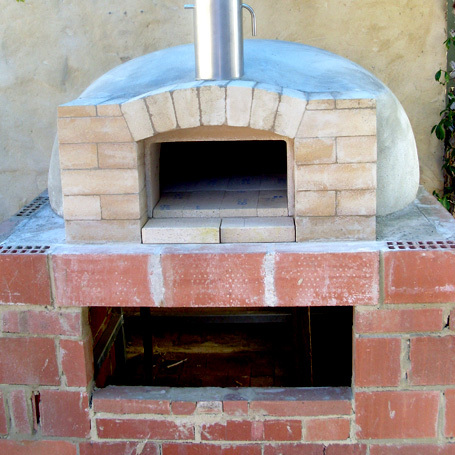 Forno wood fired pizza ovens are crafted by a person who enjoys cooking. We continually test the Forno as a part of a statistical quality control program and can assure it is built to last. Forno wood fired oven that`s our oven. Has an internal measurement of *600mm wide x 1000mm deep and requires a minimum area of *1150mm wide x 1650mm deep. Perfect for the home chef; a compact design (2-3 pizze capacity). Has and internal diameter of 1metre and requires a minimum area of *1550mm wide x 1650mm deep. The Classic would suit the more serious home entertainer or small restaurant. Our wood fire ovens are commercial quality and capable of cooking large quantities of food continuously (3-4 pizze or 3 large trays). There are four (4) sizes the *1000mm wide x 1500mm deep; is generally the size that is mostly installed in the commercial kitchen or pizzeria with a generous oven floor area. Designed to sustain maximum heat retention with minimum fuel requirements and requires a minimum area of *1550mm wide x 2000mm deep (7-8 pizze capacity). Contact Roberto Miorada for exact sizes, more information or purchasing a Forno wood fired oven. The dome that is carefully constructed with a quality castable refractory material. 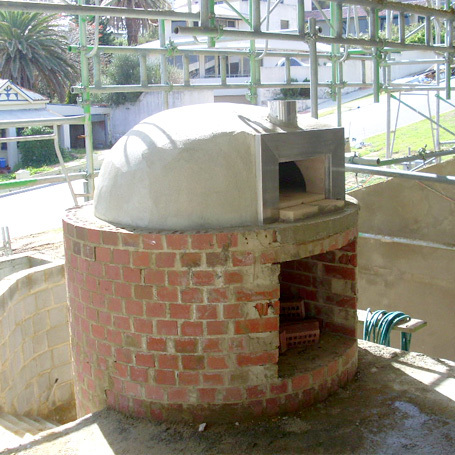 A wrapped and cocooned dome with blankets of a superior rated insulation (supporting an R 2.5 rating); to form a top-notch insulating shield together with an insulation pad, thus increasing the oven efficiency. The hearth, fashioned with refractory tiles, precisely cut so as to achieve a smooth flat hard plane; facilitating the effortless task of sliding your pizza or pans across the surface. A stainless steel fascia (manufactured out of 316 marine grade stainless steel) that promotes a modern, stylish look that is easy to clean and maintain, in an as new appearance and strengthens a traditionally weak part of the oven. 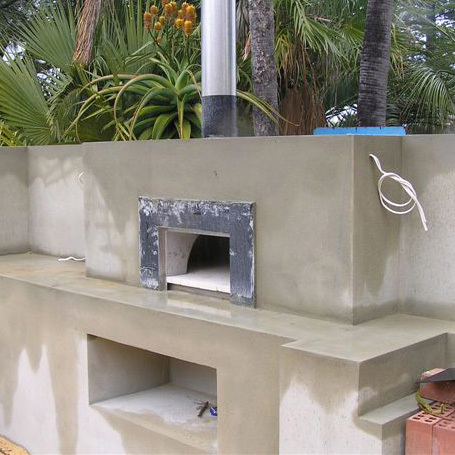 A robust protective masonry membrane is applied to shield as well as cosmetically wrap up the oven. A 1.5 metre length of stainless steel flue together with a cowl (manufactured out of 316 marine grade stainless steel) is included in the price. Installation in the Perth metro area is included in the price. Country and Australia wide orders welcome. Delivery of a complete oven on a plinth is available OR as a DIY kit. Steel frames (hot dipped galvanized) on castors can be arranged. Three, sizes are available, which includes the unpretentious home oven, suitable for balconies or areas of restricted size. Forno deploys a flue valve; allowing the oven to be shut down completely, once the fire has been removed, enabling maximum heat retention which is perfect for slow roasting or baking bread. The valve is available as an option. Functional and aesthetic features are complemented by a granite sill, that is available in a range of colours and finish. Residential size wood fired pizza ovens can be either purchased in kit form or installed by our experienced staff on your base or on a steel frame on castors. 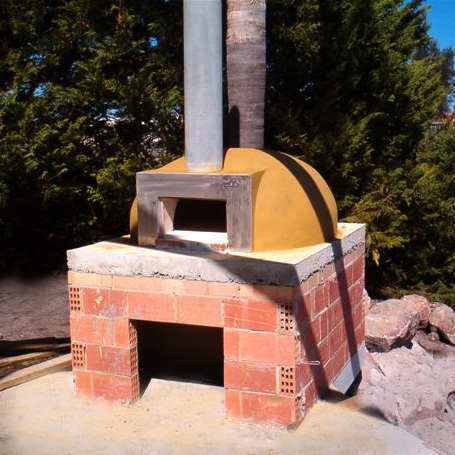 Forno Wood Fired pizza Ovens can be installed on your prepared base by experienced staff, generally in just one day and installation in the Perth metro area is included in the price. 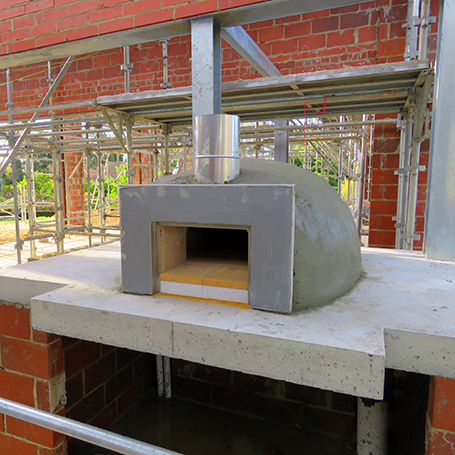 Forno can construct the oven on a reinforced concrete plinth girt by an angle iron frame (that is hot dipped galvanised) with removable lifting eyes, ready for shipping to any part of Australia. 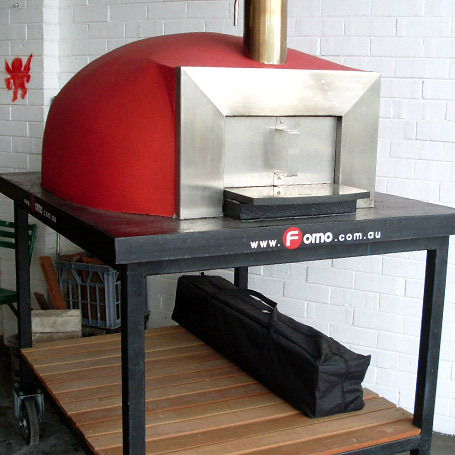 Forno can provide a steel frame (that is hot dipped galvanised) on castors, giving you the option of moving your pizza oven around your outdoor area or relocating it should you decide to move house or restaurant. We can advise on the best method to suit your needs, just ask.